The Palm Pilot, One of my most frequent pocket items, right behind my Swiss army knife and wallet. It has become one of those things I don't know where I'd be without it. I'm sure a lot of you reading this share similar feeling with your handheld. I've gone out, and gotten a nice case, screen covers, the good styli and a lot of other fun little things for my baby, and I'm not the least bit disappointed by them either. The only think I don't like about the handhelds is the fact you have to use a stylus to write. During a normal day, it's not that big a deal for me, grab it, jot down something quick, and you're off and running again. That's no big deal, however on some days when I'm stuck at work, I end up writing a lot more than just a quick note during my spare time when I'm not busy. When I'm doing that, my hand starts to hurt from holding onto that skinny little stylus it has (I've got some big long hands.) I wanted to get the big folding palm keyboard for myself. That thing rules, a full size keyboard that collapses to match your Palm's size. It's GREAT... when you have a desk to put it on. I don't have a desk when I'm working, so it wouldn't help me much at all. 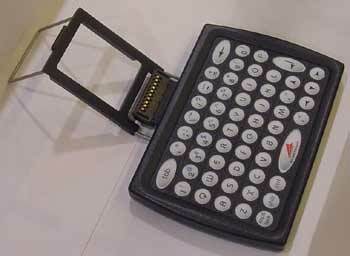 So I guess what I really wanted was a keyboard for a palm pilot that was small enough to hold in my hand and still use comfortable with the palm pilot. I wasn't expecting to find one, let alone one that'd work well. 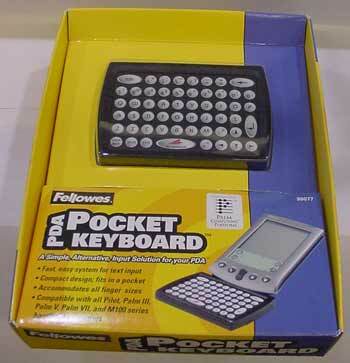 Then I was a small palm keyboard from Fellowes, and at the 40$ it come up, its not that bad. So I went for it. Now lets take a look at it and see what it does, and more importantly if it works. The unit comes in a cleverly folded box, which is very user friendly to open. This was handy, as it let me try the keyboard out in the store before I bought it. (Note to packaging designers: when you make something, I know making it easy to open is good, but make sure someone can't walk up to it, pop it open and walk out with it in their pocket in under 15 seconds without hurting the package.) The keyboard itself is displayed in a bubble on the front of the package, which lets you get a nice look at it. Its also slightly deceptive about the size of the unit, as it doesn't show you that there is an adapter you have to plug into the keyboard to make it work with a palm (Oops!) which there are 2 of inside of the package. In addition the driver application for your palm is chillin on a floppy disk (yes a FLOPPY disk) in with the manuals and such. This means it is notably smaller and lighter than the Palm IIIXE I have, so it's not that much to carry around. The design is pretty solid, with the support arm, not being overwhelming, but plenty for a palm pilot. Got big fingers? Don't apply. Overall the experience with this was pretty positive. Easy to get started and get it running, and pretty much idiot proof on the install. The use was overall pretty simple and easy to get used to. Only thing I really observed is that people with larger fingers would REALLY have a tough time getting this to work right. 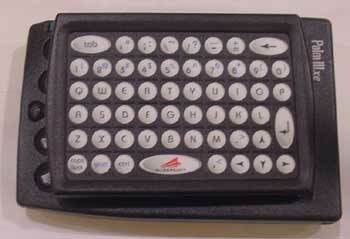 The Fellowes Glidepoint PDA Pocket Keyboard would likely be a welcomes addition to most palm users arsenal of toys and gizmos.